Despite suspicions of global warning, Port Mulgrave was excluded for the day, as spring turned back to winter. The group descended the cliff to look at the remains of this industrial setting. The main objectivewas to view the general geology with the bonus of seeing any remaining jet and search for fossils. Despite the driving rain the beach was being researched separately by a natural history group and Open University students. Hard hats were essential due to the instability of the cliffs. We first progressed northwards. Ammonites could be seen in the wave cut platform and signs of jet extraction could be seen inplaces. Jet is uniquely formed from branches of Araucaria wood, the monkey puzzle tree of the present day The OU students were performing a logging exercise in a short section of bedding to extract microfossils i.e. foraminifera, to understand how they potentially adapt from benthic to an anoxic environment. We were reminded of the erosion impact of the weather on these cliffs as a small rock fall fell close to the OU students, where we were previously standing. The group moved south beyond the old jetty observing the disturbed bedding possibly due to faulting or slumping? Mineralised fossils were observed, mainly bivalves with an attractive gold leaf appearance from the pyrite. A large communal coral was tested with acid confirming that the matrix of the rock was a limestone. The splitting of some of the shales revealed large ammonites. The larger specimens (up to 8in across) appear to be Dactylioceras Tenuicostatum of the early Jurassic period. Recovering the large fossils from the beach to the top of the cliff was a cross between an Olympic torch relay and world’s strongestman competition, with at least one member of the group turning an unattractive shade of puce. enabling faults in the rock face to be tracked across the wave cut platforms.Identifying the various beds was performed using a rough and ready technique of judging the height via the ‘artist’ thumb and using our leader as a scale at the base of the cliff, where the Middle and Upper Lias were on display. 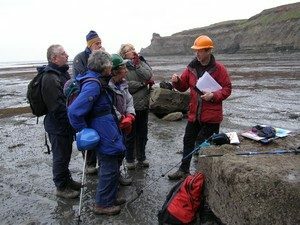 We progressed to Old Nab to observe the trace fossils such as Thalassinoides and Rhizocorallium, the Pecten beds with Pseudopecten fossils and the remains of the old iron workings using pillar and stall methods. Dinosaur footprint ‘shaped’ objects were observed and discussed. Belemnites were common and were often seen facing the same direction, suggesting they were deposited in a gentle flow of water. In the end the only evidence of dinosaurs were of the engineering type as the human trace fossils of trackways and jetties allowed the industrial archaeology to complement the impressive geology.